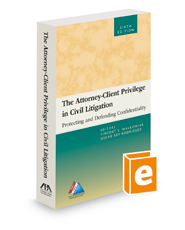 This edition has been updated and expanded to include new revisions of the attorney-client privilege and work product doctrine. Many of the previous chapters have been completely revised, while others have gone through a comprehensive rewrite. Legislative activity at both the state and federal level to limit (or preserve) evidentiary privilege and confidentiality duties of attorneys, along with debates over the Sarbanes-Oxley Act and related enactments, continue to fuel the perception that attorney-client privilege is under attack. Fortunately, this oldest of Anglo-American evidentiary privileges continues to hold its own. Much of the conflict and controversy continues to play out in the courts. Independent of judicial determinations on privilege, the practical fragility of confidentiality continues to take the national stage as the media reports on governmental surveillance, massive data breaches and the interception of electronic communications between attorneys and their clients, particularly in international scenarios. Continuing the tradition, many of the chapters include helpful appendices of forms, supplemental and illustrative documents. The scholarly work of the numerous authors and contributors is evident in each of the chapters.